I’m going to invite you to sign up for a FREE copy of "The Axully Art Roadmap" so you can learn even more about my proven path to Art & Peace. I was talking to a friend the other day who just retired. She’s perfectly content…except…got teary when she described the feeling that for 50 years she has been “needed” in her career. Now that feeling has to be filled with something. She axully got lint in her eye. Not a crisis, but definitely a cliff of sorts. Another is SO curious about learning to paint, but is convinced she never got the crayon lessons in grade school. NOW, that is a challenge…I’d rather start with a blank slate than with someone who has preconceived notions from all over the place! Each was somewhat content with how they spent their retirement, but were curious about something different…like learning to paint. .
I’ve designed a method of teaching that is so easy to grasp…A direct roadmap to being an intermediate painter. Mistake #1: Your “want-to” and your “going-to” are far apart. When you can figure out what feeling causes the distance, you can shorten it. Mistake #2: Watching an entire season of “Friends” in one afternoon, is not exactly the most creative way to spend your time. Wanna know something fun? Painting will hold your interest a whole lot more than the TeeVee. Mistake #3: Doing the same things every day makes your brain shrink. Really! Let’s get those brain cells humming again! As with most creative explorations, the tools are always essential. Stained glass makers have to have cutters and grinders and welders…no, soldering stuff. While these are a one-time purchase, what if you don’t like it? Painting requires a few tubes of paint, a brush or two…you can even paint with a stick from your yard. Even make your own paint from dirt...kid you knot! Remember learning to type? Bet you didn’t sit down that first class and do 100 words a minute, didja! It took WEEKS of Practice. Julia Child had to cut up hundreds of onions before she cold tackle a chicken. If you know what you are looking for, you will see it and decide how to duplicate it. if you don’t know what you are looking at, you will stay lost…guessing at what to do. Seeing is something we take for granted. We “see” things everyday and assume we “know” what we are seeing. After I show you what you are “seeing” you will see in a different way. II hope you know that every mistake I talk about is one I’ve made. Every simplification I talk about is one I took years to realize. I have also figured out a way to condense what I did in 15 years to what I teach you to do in 30 days. 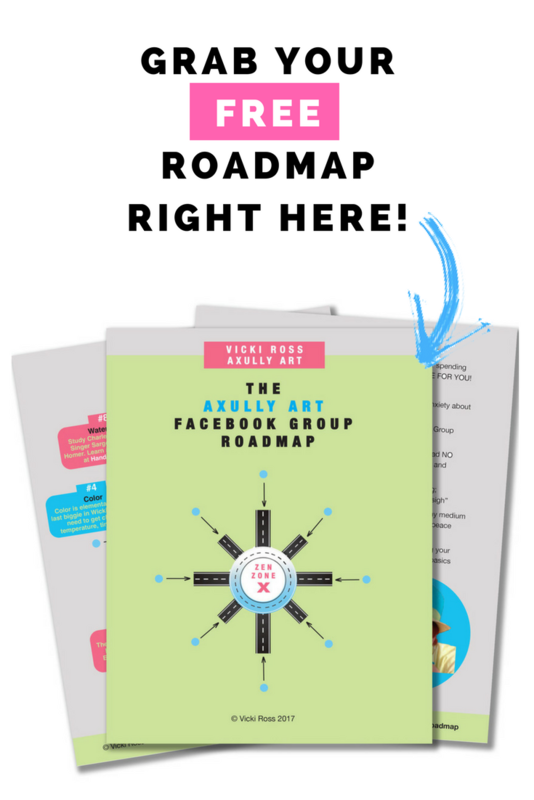 If this sounds interesting, click the link and download your FREE copy of "Axully Art Roadmap". AND, get in my FREE facebook group and join the Axully Artists there. The FREE Axully Art Roadmap is here.